“I do not pray that thou shouldst take them out of the world, but that thou shouldst keep them from the evil one” (John 17:15). These words from Jesus’ High Priestly Prayer at the Last Supper are a useful reminder during the season of Lent that Jesus is praying for us now, as He prayed for us then. And this is especially helpful as we have just now stepped over the Ash Wednesday threshold into Lent, so that we will keep it in mind as we falter and stumble. It would be great if we could be taken out of the world for our Lenten forty days, or if we could at least be sealed up in a cloistered monastery until Easter. How much easier it would be for most of us not to have to drive past McDonald’s or Starbucks (if we’ve given up Quarter Pounders or venti Almond Mocha Latte’s). How much more successful we could be in our Lenten discipline if we didn’t have to sit with our family in the living room watching them eat chocolate, when that’s what we’ve given up for 40 days! And yet, Jesus prays not that we will be taken out of the world, not that we will be sealed up in a secure vault somewhere. 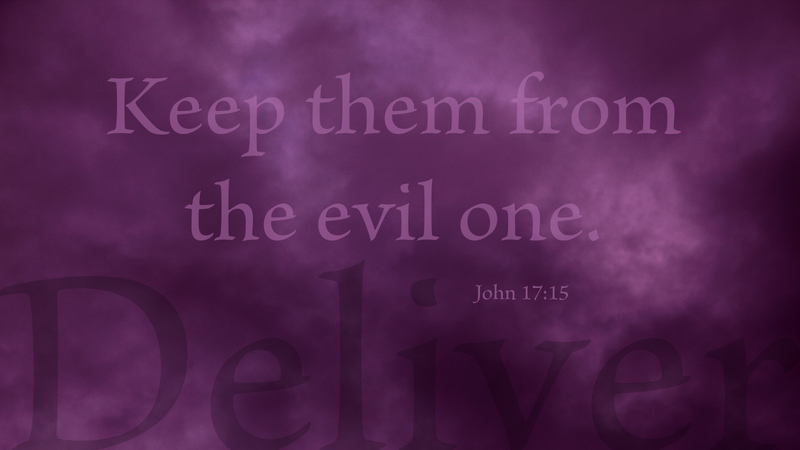 Rather, Jesus prays that we should be kept from the evil one. On the one hand, the evil one is Satan, who comes to tempt and try us, just as he tempted and tested Jesus in the wilderness. At the same time, you and I are “evil ones” as well, as our greatest enemy during Lent is ourselves! Although we make Lenten commitments—to deny ourselves some pleasure, to come to Sunday or midweek worship each week, to do home devotions every day—the truth is our greatest temptations sometimes come from within. When we hear Jesus praying that the Father would keep us from “the evil one,” let’s hear Him praying that we will be protected and kept from ourselves, that we not succumb to the inner voice within trying to lead us astray. Prayer: Almighty God, we are not asking to be taken out of the world, but that by your Spirit, you would protect and keep us from the evil one, and from ourselves; through Christ our Lord. Amen.